Molten cakes, lava cakes, warm truffle cakes, these go by many names and no one seems to be tiring of them. Their supposed history is murky. Many credit Jean-Georges Vongerichten, while others say that while he did popularize the dessert in the 90’s in NYC, that the recipe had been made in France for years before. The point is that while they look and taste fancy and complicated, they are actually very easy for the home cook. No need to pay the high restaurant prices. As this dessert is all about the chocolate, please do use the recommended chocolates for best results. If you melt down chocolate chips, I take no responsibility for the outcome. You can use whatever flavor ice cream you like, but I am partial to the chocolate/coffee combo. Generously butter eight, 3/4-cup soufflé dishes or custard cups. Sprinkle inside of each dish with 1 1/2 teaspoons sugar. Stir chocolate and butter in heavy medium saucepan over low heat until smooth. Remove from heat. Using electric mixer, beat eggs, egg yolks, and remaining 5 tablespoons sugar in large bowl until thick and pale yellow, about 8 minutes. Fold 1/3 of warm chocolate mixture into egg mixture, then fold in remaining chocolate. Fold in flour. Divide batter among soufflé dishes. (Can be made 1 day ahead. Cover with plastic wrap and refrigerate. Bring to room temperature before proceeding. Position oven rack in middle of oven. Preheat oven to 425°F. Place soufflé dishes on rimmed baking sheet. Bake uncovered until edges are puffed and slightly cracked but center 1 inch of each moves slightly when dishes are shaken gently, about 13 minutes. 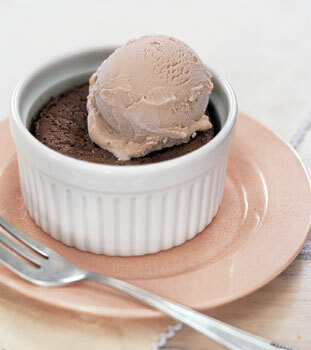 Top each cake with scoop of coffee ice cream and serve immediately.